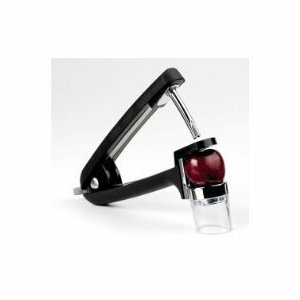 The stain-free, mess-free way to remove cherry stones, this OXO Good Grips cherry/olive pitter includes a custom-fitting cup to catch the pit from small or larger cherries, such as Bing or Rainier. The soft comfortable nonslip handles provide the cushioned surface for effortless pressing. Quickly removes olive pits, too. Locks closed to store. Die-cast zinc and Santoprene. Dishwasher-safe.